When I came up with the theme of Dishes So Simple, No Recipe Required for this month’s Go Ahead Honey, It’s Gluten Free carnival, I did so because that’s really how I cook most of the time. Many times I have to concentrate on actually recording real recipes to share here at gfe. I do so because the major focus of my blog is sharing recipes, and a lot of my gfe readers will only cook using a recipe. However, my hope is that this month’s Go Ahead Honey will inspire folks to just get in the kitchen and have fun cooking using the concepts shared in the roundup rather than having a recipe in hand. Meals like this Saucy Cheesy Chicken Veggie Pasta Skillet Supper are often the result of me creating a main dish without a recipe. Here’s the basic concept for my pasta skillet suppers, with notes in parentheses on what I consider options and how I made the pasta skillet supper that’s pictured. Although I gave this "non-recipe" a name based on my latest concoction, the only real name should be Pasta Skillet Supper because the rest of the ingredients will vary based on what your personal preferences are and what you have on hand. Use this framework, but get as creative (or not) as you wish! Add a couple of tablespoons of oil, butter, or liquid to your skillet. (Sometimes water or broth is what I use.) Heat skillet to medium. Add any uncooked meat or seafood that you wish to cook. (I added some uncooked chicken tenderloins for the recipe shown. 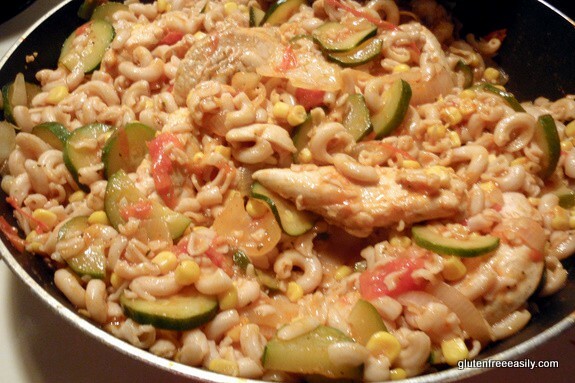 If using already cooked meat or seafood, wait and add it with the cooked pasta.) Cook for a few minutes on either side. If meat or seafood is done, remove and set aside. Otherwise, you may continue to cook meat or seafood with the other ingredients you will be adding. Saute until veggies begin to soften, stirring frequently. Immediately add in cooked pasta. If you had already cooked meat or seafood for your dish, as well as any other already cooked veggies you think would work well, add them at this time, too. (I added in some leftover corn and broccoli.) Stir until all is coated with sauce. Increase heat and cook until all is heated through and any liquid is reduced to make a sauce to your liking. Stir as needed while cooking. Turn off heat. Sprinkle with cheese (dairy or non-dairy, or nutritional yeast, if desired)---either while in the skillet or once served on plates. I generally prefer the latter because it’s easy for me to serve Mr. GFE a dairy version while serving myself a non-dairy version if I so choose. Sometimes cheese is not the right ingredient to add to skillet dishes. I made a skillet pasta dish when camping this summer that used brown rice ziti with grilled shrimp, olive oil, garlic, onions, and coconut milk plus some salt, pepper, and chipotle powder. It was just perfect as it was; no cheese of any kind was needed.Work with what you have and play with flavor combinations that have worked in other dishes. For example, if you love lasagna, then some ground beef (and/or ground sausage), tomato-based ingredients, cheese(s), and complementary veggies (e.g., zucchini, spinach) might be a good idea. If your family loves cheeseburgers, a cheeseburger macaroni dish would probably be welcomed. If you’re vegetarian and love chickpeas, some combination of roasted chickpeas and seasonal veggies cooked with the pasta in a veggie broth might turn out to be your favorite non-recipe pasta dish. You get the idea. Honestly, I find these non-recipes to be some of the most satisfying dishes that I make because I exercise creativity and “carefreeness,” but yet always end up with a delicious one-dish dinner. Plus I totally fill my skillet when making these dishes, so we always have leftovers for lunches or dinner the next evening. See all the non-recipe entries in my Go Ahead Honey, It’s Gluten Free roundup post here—so many great ideas! Don’t forget that Iris (The Daily Dietribe) is hosting this not-to-be-missed monthly event for September. 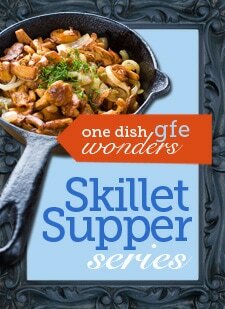 Also, look for a five-day series here at gfe in September—September Skillet Suppers—where I’ll share some of my favorite one-dish dinners with an appropriate giveaway at the end for all who have commented during the week. This post is linked to Hearth and Soul Blog Hop. Yum! Quick, easy, and delicious. Can’t beat that. Shirley – we love dishes like this too – easy, tasty, with lots of cheese – what is not to love! Hi Ina–I know you like these kinds of dishes, too. I’ve looked at them longingly on your blog a lot. 😉 And btw your latest recipe, Chicken Ragout, looked excellent! Had to get a tissue to wipe off my drool on my keyboard here at work. So embarrassing! Looks delish! I am a huge fan of pasta skillet dishes – they were a mainstay at my house when the boys were growning up. Yours is making me very hungry right now! Are you home? Hi Carol–One more night of vacation and then travel day tomorrow. It’s been a great time, but going home will be wonderful, too. 🙂 As a mom of hungry boys, your endorsement of the pasta skillet dishes speaks volumes! How did you know we just bought some gluten-free pasta? 🙂 This looks really good to me! 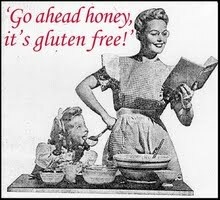 And hey, I’ve tried to create my own blog…the next post that I do, I hope to write about celiac and gluten free! Stay tuned! I’m so excited about your new blog, Georgia Girl with an English Heart! I can’t wait to read your post about celiac and living gluten free. Comfort food! This is a great quick meal Shirley. I love your tips and method, thanks for sharing. I’ll be trying a vegetarian option for sure. My kids love pasta so it’s a great way to get more veggies into them. I’m out of the loop this month. I suppose I missed the deadline? What a great way to use up all those ingredients hiding in the back of the fridge! I often do this non-recipe type of recipe with left over rotisserie chicken, easy and fast. 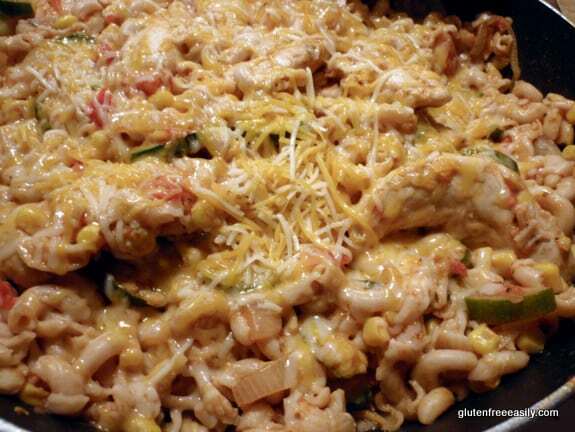 Your Saucy Cheese Chicken Veggie Pasta Skillet Supper looks delicious, Shirley! I love to get creative in the kitchen like this, just cooking with what I have. Thank you for sharing this tasty, wholesome inspiration with us at the Hearth and Soul Hop. April–This is indeed my favorite way to cook! I think that folks are less intimidated with cooking when they realize it really can be this easy and this delicious. Thanks so much for all the sharing! I appreciate Hearth and Soul Hop!